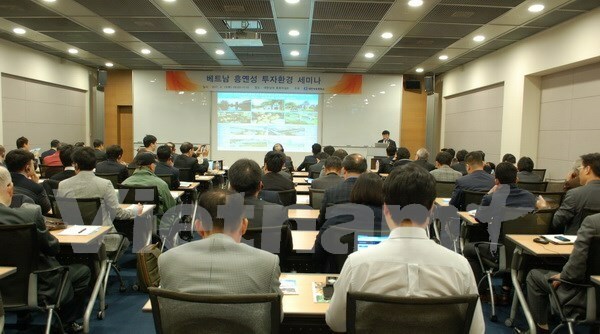 Seoul (VNA) – Vice Chairman of the Hung Yen provincial People’s Committee Nguyen Van Phong called for foreign investment, including those from the Republic of Korea (RoK) at a workshop in Seoul on April 13. The event saw the participation of Vietnamese Vice Ambassador to the RoK Tran Anh Vu, representatives the Korea Chamber of Commerce and Industry (KCCI) and 100 entrepreneurs from RoK and other nations eyeing on Hung Yen investment opportunities. Phong introduced his locality’s potential to participants, underlining the young population, trained human resources, stable economic growth and increasing export value. Hung Yen has focused its investment on developing technical infrastructure and human resources training. The province is home to numerous successful RoK investors, including Hyundai Aluminum Vina, Tae Yang Vietnam, DongYang, Mirae Fiber, Phong affirmed. He pledged that the locality will create the most favourable condition possible for foreign investors in line with the country’s law. Addressing the event, Kang Homin from KCCI said many RoK firms have smoothly operated in Hung Yen, adding that the event will presents a good opportunity for RoK enterprises to have an insight into the province’s potential. He also offered to connect local enterprises with Hung Yen, affirming that strengthening trade exchanges between the two sides will contribute to economic and diplomatic ties between Vietnam and the RoK. In his address at the event, Vice Ambassador Tran Anh Vu said the RoK has become one of Vietnam’s biggest investors, with over 50 billion USD and 5,600 enterprises, which created jobs for around 700,000 labourers and accounted for 30 percent of the country’s total exports. The presence of such big names as Samsung, LG, Hyundai, Kia, Lotte, Posco, Shinhan, Hyosung, Hanwha in Vietnam has proven the attraction and safety of the country’s business environment, he said. He underlined the win-win Vietnam – RoK relations, saying that they explore financial and technological resources of the RoK and skilled and large human resources of Vietnam. The diplomat expressed his belief that more RoK firms will invest in Hung Yen to implement new projects and expand the existing ones after the event. At the workshop, representatives from different sectors of Hung Yen introduced big projects calling investments.